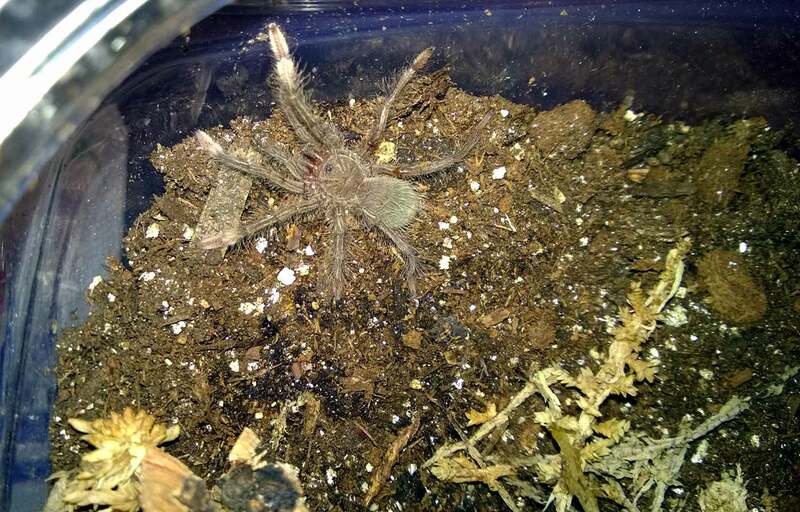 Finally, I caught it…my P. crassipes feeding! I have spent the last several weeks trying to get a feeding video of my juvenile Phlogius crassipes. Although this smokey-gray beauty has become a bit more brazen as it has gained some size, it usually retreats to one of its many burrow entrances at the slightest disturbance. My first attempt in catching it hunting didn’t end in a kill, but served as a wonderful example of just how fast this species can be. Well, last night, I was shocked to find this little guy just standing on the surface as I took the top off of its enclosure to feed it. After snapping a few pics of it just calmly hanging out in the open, I then dropped a cricket in. My T first bolted to its den. However, as I broke out the phone to catch it on video, it immediately went into hunt mode…yes! My juvenile P. crassipes just chilling out on the surface. A fantastic spider shopping experience! 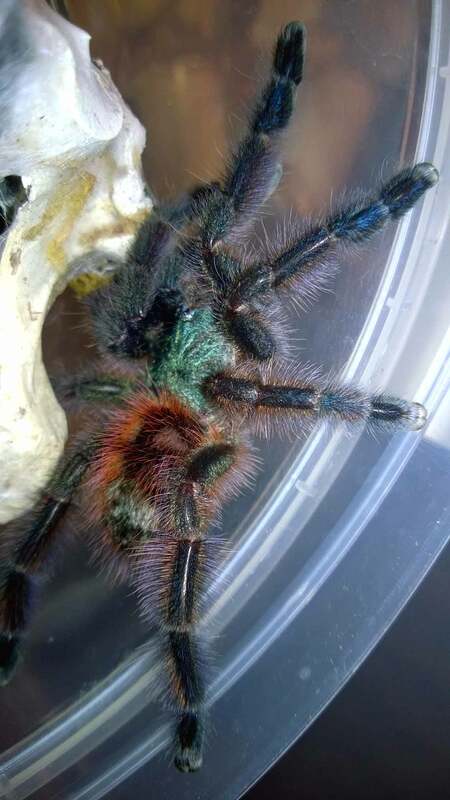 I recently discovered Great Basin Serpentarium while perusing the For Sale/Trade/Want to Buy section on Arachnoboards. 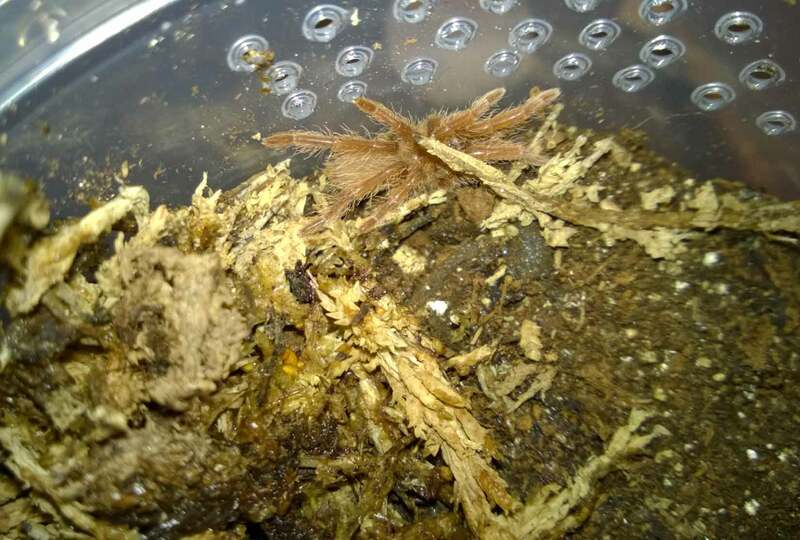 I had been on the lookout for some T. stirmi slings, and GBS was offering 1.5 spiderlings for $90 each. 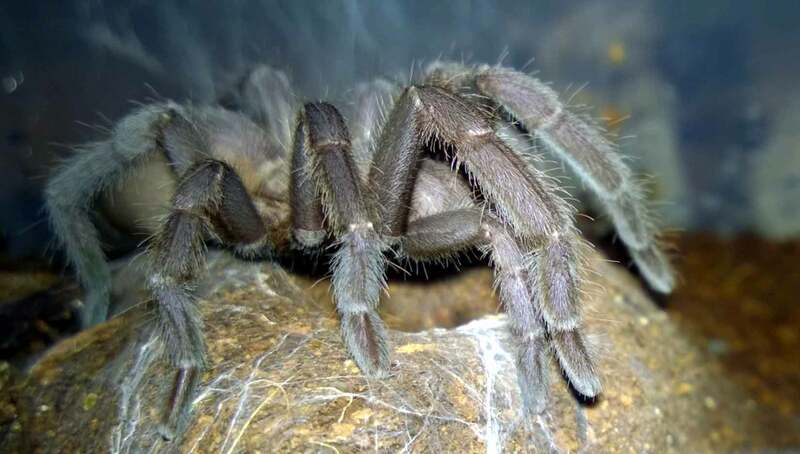 Checking out the rest of the list of Ts for sale, I was excited to discover the they were also offering many other species I had been looking for. The prices were quite good, and I was floored to learn that they offered $20 FedEx next day shipping with any order of totaling $100 or more. I shot the owner, J Mugleston, an email query about a possible purchase, and he got back to me within the hour. In fact, his communication throughout the entire experience was exemplary with all of my emails being answered promptly and politely. 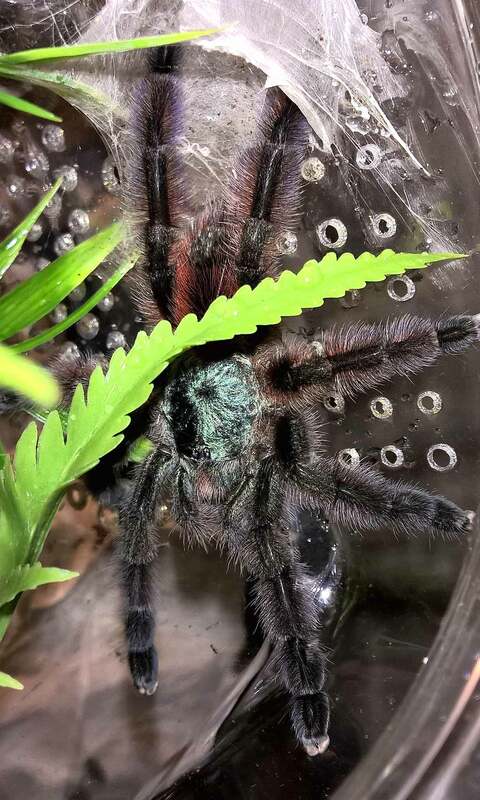 Last Friday, I put my order in for seven slings: 2 T. stirmi, 2 P. muticus, 2 M. cabocla, and 1 B. auratum. Mr. Mugleston worked with me to ship my items to the local FedEx on a day of my choice, and I picked up my package yesterday. 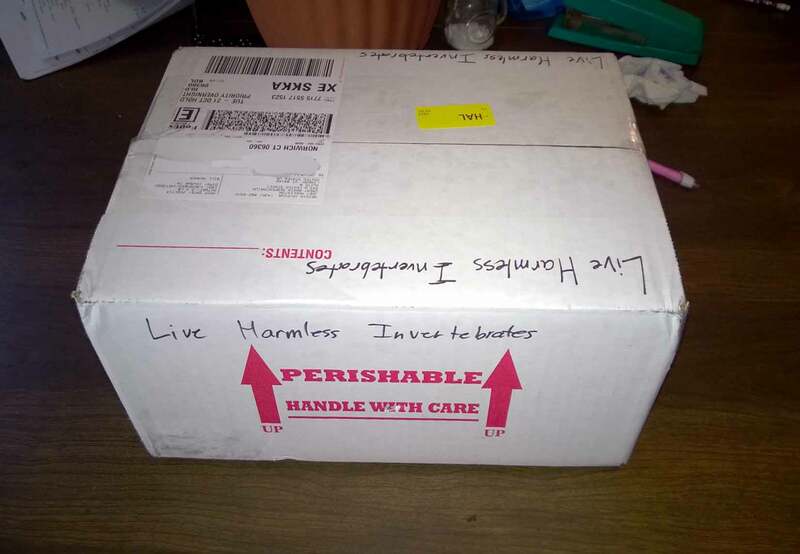 The box was labeled “Harmless Invertebrates”, which I though was a nice touch (the clerk at the counter actually handled my package as if it were dynamite!). My package for GBS. LOVE the labeling! My new acquisitions were very well packed in a box lined with foam insulation and crumpled newspaper as padding. A heat pack was included, which was great due to the unseasonably cold temps we’ve had in my state. Each spider was packed in a plastic dram vial in moistened paper towel, and the bottle lids were taped with electrical tape. These little guys were well-protected during shipping. My package from Great Basin Serpentarium. My Ts were warm and very well packed. 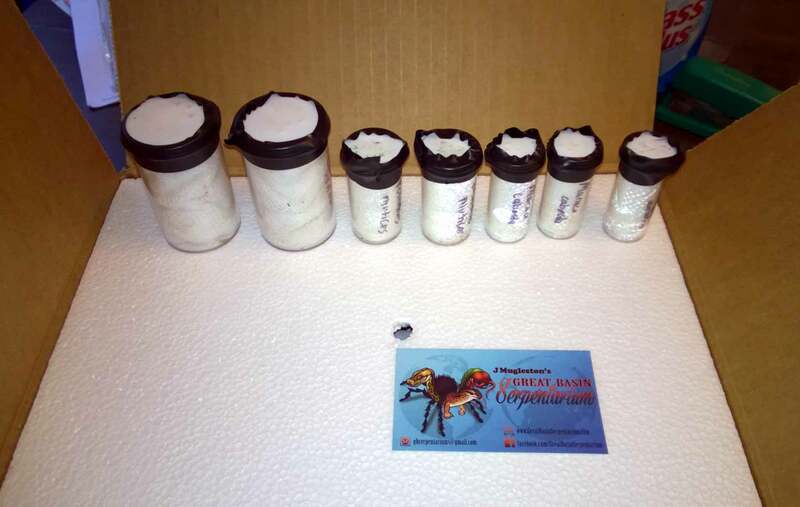 I should mention that the way the tarantulas were packed in the vials made it VERY easy to get them out for rehousing. The paper towels were packed in tightly enough to protect the T, but loose enough that towel could be carefully pulled out of the vial and unrolled to safely free the animal. This made rehousing these little guys a breeze. The vials holding my new slings from GBS. All were well packed and labeled. The slings themselves were in fantastic shape, and it was obvious that they were healthy and well cared for. All were lively during rehousing, and all but one has already eaten (one of my P. muticus slings was a bit too busy burrowing to grab a snack). Great prices, communication, and shipping costs! I could not be more pleased with my experience with Great Basin Serpentarium. 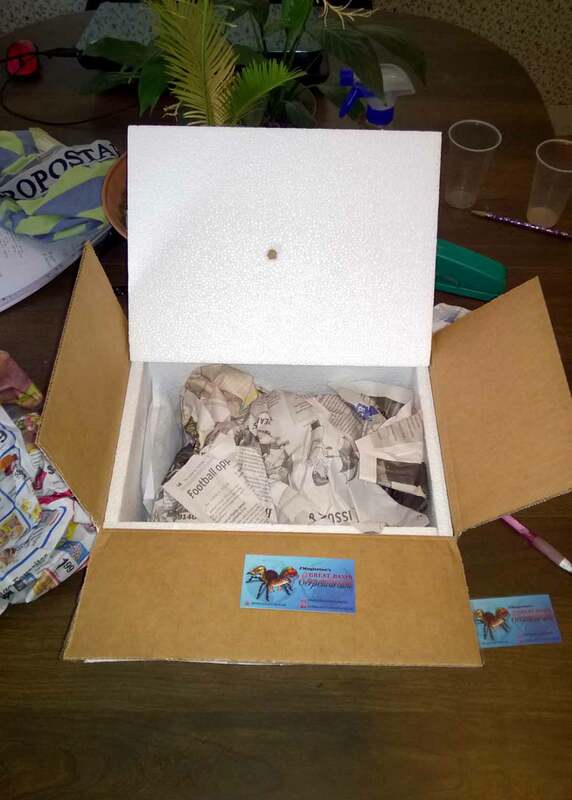 The prices, especially with the $20 next day shipping, were fantastic, Mr. Mugleston’s communication was outstanding, my order was perfectly packed, and the animals arrived healthy and lively. I would definitely recommend GBS to other tarantula enthusiasts, and I will definitely be shopping there again in the future. And…a couple pics of my new acquisitions! My new .75″ P. muticus sling. 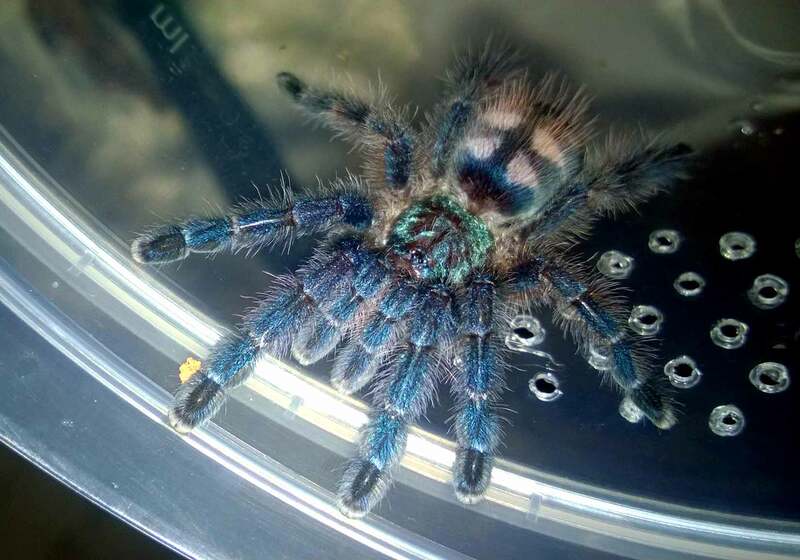 My new 1/5″ T. stirmi sling. Now that I’ve got my new sling, what do I house it in? When I made the decision to purchase my first tarantula slings, I next needed to choose which enclosures I would use to house my new acquisitions. 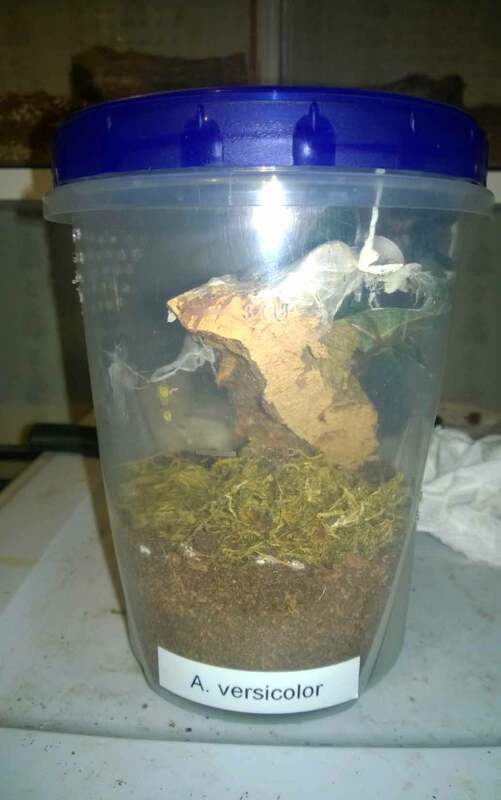 I had researched many alternatives, from deli cups to dram bottles, and I wanted to be sure to choose something that would allow me to maintain the appropriate environments my spider’s would need. Too much ventilation and I would risk the enclosure, and my T, drying out. Not enough ventilation, and the stuffy, overly-moist conditions could prove a death trap. I also had concerns about security; namely, would my T be able to escape from ventilation holes (or would the design of the home make it easy fro the spider to scoot out when it was opened for feeding or cleaning?). As luck would have it, my first sling purchase was made at Jamie’s Tarantulas, and I took advantage of a couple deals she was running that included both a sling and one of her wonderful sling enclosures. I still use these enclosures, as they offer many perks that I will get to later. However, since then, I’ve done a lot of experimenting with other types of homes for my slings, and I’ve discovered some “found enclosures” that are also quite useful and versatile. So, if you’re on the lookout for a good sling enclosure, you may consider the following. A couple simple deli cups. Note: if using these to house a sling, I would not use the screened top as it would allow for too much airflow. Deli cups are an enclosure staple in the hobby, and for good reason. They are inexpensive, versatile, come in many sizes, and are easily-acquired. They are also stack-able, which can allow those with large collections to easily conserve space. Full disclosure: I personally don’t use deli cups to house my Ts; I have always used other alternatives. But to ignore deli cups on a list of suitable alternatives would be ridiculous. 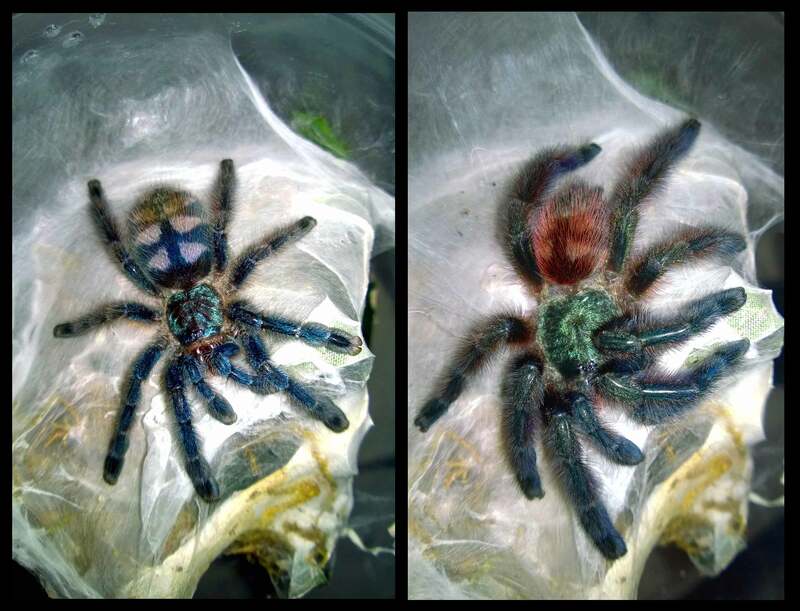 Three sling enclosures from Jamies tarantulas. I have a dozen of these, and I love them. To date, I’ve purchased about a dozen of these, and I still love and use them. For those buying slings from Jamie’s site, picking up one of these little beauties is almost an academic decision. Not only do they look great, but for a very reasonable $7.95, you get all the fixings, too (cork bark, silk plant, coco substrate, and moss), which is SO convenient. They look great on a shelf, and I’ve safely housed over 20 slings in them without incident. Before using one of these enclosures for the first time, you will want to open and close it several times, as the cover fit can be quite stiff initially. Personally, I like how you can basically “hinge” the top on the bottom when feeding Ts, which keeps the opening small and prevents escapes. She sells these enclosures in both terrestrial and arboreal versions. Can’t be stacked on each other. Plastic vials used to house small slings. Like the deli cups, plastic dram vials are used by many keepers to house their slings. They are inexpensive, easily adapted, and fantastic for keeping in precious humidity. Plastic dram vials come in many sizes, including very small sizes perfect for tiny slings. 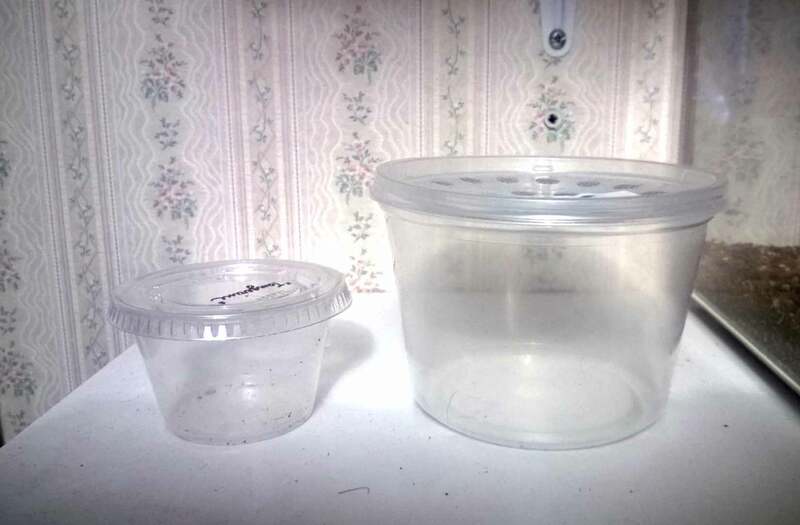 Pictured above are two that are currently housing 1/2″ Hapalopus sp. Columbia slings, and a smaller dram which is home to a 2/5″ B. albopilosum sling. All of these slings started off much too small for my other enclosures, and the smaller sizes of the plastic drams proved the perfect alternative. Modified Ziploc storage containers. These are very versatile and can be used to house burrowing, terrestrial, and arboreal Ts. I started using these several months ago after buying a boatload of plastic containers at Walmart to experiment with as enclosures. Since then, they have quickly become my go to enclosure for slings 1″ or larger. Although they come in two sizes, I have switched almost exclusively to the taller size shown above. As you can see, you can fill it with more substrate, meaning burrowing species can dig elaborate burrows (H. gigas), or use less substrate and a piece of cork bark for arboreal species (the P. metallica on the right). These enclosures are easily modified with a hot nail or soldering iron, and they are wonderful at holding in moisture. They feature secure, twisting lids that offer wonderful security, and they are stack-able, which is great for space-saving. At about $2.50 for two, they are also very inexpensive. I love using these for faster-growing species, like my Phomictopus, as they are roomier than other enclosures and allow more room for growth. I will continue to try to find new and interesting enclosures, and if anything should prove particularly effective, I will definitely add it to this list.